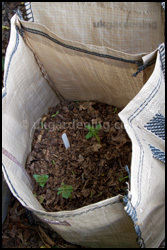 How to grow potatoes in bags or containers. If space in the garden is tight, potatoes can be grown successfully in potato grow bags, large tubs or half barrels. The container should be at least 45cm (18in) wide and double this in depth. If you get your seed potatoes in January or February chit them in seed trays or egg trays. In late March, half fill your container with a 50-50 mix of compost and top-soil. Place 3-4 seed potatoes, with their eyes uppermost, 4 inches apart on top of the soil. Gently, trying to avoid breaking any of the new shoots, add a further 6 inches of the soil/compost mix. As the potato shoots grow and emerge from the soil surface, add another 6 inches of the compost. Continue to do this until you can fit any more soil into the container. If planted in January they should be ready by the beginning of June, otherwise the should be harvested in July/August. Once emptied, half refill the container and plant again with a late season potato variety, such as 'Charlotte', for a mid-winter crop. In 2011, I grew a collection of potatoes from Marshalls in three potato grow bags: 'Duke of York' an early variety, 'Charlotte' and 'Maris Peer' both second early potatoes.